By Martin Phelan | April 29, 2013. The Lockout was a watershed moment in history for Ireland and of course Dublin. It wasn’t just about the desire for better working conditions and wages on the part of the working class; it was also about key social issues, as unions fought for recognition from employers. Dublin in 1913 was one of the poorest places in Northern Europe. Most houses didn’t have running water and families were crammed into tiny apartments where they shared a toilet with half a dozen other families. In the midst of this poverty was the tramlines going through the city that transported Dublin’s citizens. The tram workers themselves were paid poor wages and their hours were demanding. 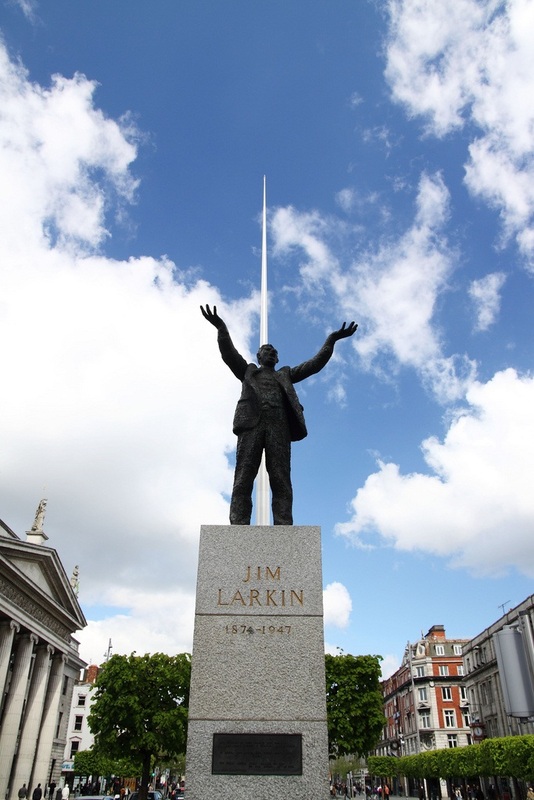 Through the leadership of Jim Larkin and James Connolly, one of the biggest measures of industrial action ever seen in this country was organised. “An injury to one is the concern of all” was the Larkin-inspired motto of a massive sympathetic strike across Dublin that at one stage threatened to reach the English shores too. But Dublin employers – led by the day’s biggest capitalist, William Martin Murphy, countered the sympathetic strike with a sympathetic lockout, where any worker associated with Larkin’s Irish Transport and General Workers’ Union was blacklisted. The lockout took its toll on the workers who, despite receiving aid from many different parts of the world, simply couldn’t hold out without the income of their jobs. Once the British Trade Union Congress (TUC) rejected a proposal to bring the strike to their shores, the battle was over. The casualties of the Lockout were considerable on both sides. Many businesses couldn’t recover with World War I causing labour shortages that were too large to overcome. On the side of the workers, many never got their old jobs back despite the shortages in labour. The effects were particularly heavy in the Liberties as 400 women who took part in the strike never got their jobs back in the Jacob’s Biscuit Factory. The British were inevitably blamed for the failure of the strike but that is perhaps unfair. Padraig Yeates, author of Lockout: Dublin 1913 is of the opinion that Irish leaders used the British as scapegoats in an attempt to cover their own failings. The Lockout is seen by many as a dress rehearsal to 1916 but Yeates believes that it had a much more significant part to play in Ireland than simply being a prequel to the Easter Rising. Yeates argues that the Lockout was a battle over the ownership of wealth in society and the control of society, which was hijacked by the nationalist-movement for independence from Britain. Yeates himself is now apart of the 1913 Committee, which is seeking to reclaim the Lockout from the shadow of the Easter Rising and make it important in its own right. World War I cost the Lockout a bigger part in Irish history as the self-analysis it started within Irish and Dublin society was put on hold with many people shipped off to war. However it wasn’t all for nothing either as, despite Larkin’s retreat to America as well as James Connolly’s execution for his part in the 1916 Rising, the union movement in Ireland rebuilt itself stronger than ever. While the Lockout may not have received the recognition it deserved, it did impart a lesson on Dublin’s workers that is still prevalent today. The most current example is the battle over Croke Park II as public sector unions battle the Government over the proposals it contains. The Lockout may have damaged the union movement in the short-term but 100 years on it’s still empowering it. Image: Pierre-Louis Ferrer on Flickr.